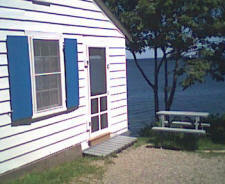 This two bedroom shore cottage, # 17, has 2 double beds in each of two back bedrooms. There is a connecting hallway between the two rooms and the bathroom with a shower is located off this hallway. 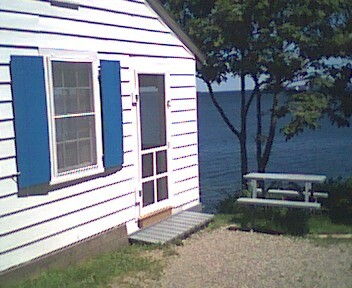 Along the oceanside of the cottage there is a glassed-in porch which has a couch, TV, dining table and chairs. Each of the back bedrooms has a curtained opening that looks out onto the glassed-in porch, allowing a view of the ocean from the beds. A kitchenette is located off the porch area.